Prevents loss of sharpness & contrast by absorbing the ultraviolet rays which often makes outdoor photographs hazy and indistinct. Enables colors to become more saturated and appear clearer, with better contrast. Corrects the green cast created when using daylight under fluorescent lamps with daylight tubes. It restores the natural colors of your shooting objects. 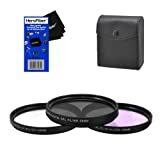 This filter kit is designed for use specifically with the 58mm lens. A filter is ideal for protecting your valuable lens from scratches and dust. -UV filter absorbs ultraviolet rays to produce crisp, clear photographs. A UV filter is used to reduce UV rays from entering the lens and striking the film but will not affect color balance. It also protects the lenses from expensive front element damage which could be caused by dirt, knocks or scratches. A Polarizer is different than most filters in that it is composed of two pieces of glass, mounted independently inside a round frame so that one can be rotated relative to the other. As it is rotated, it increasingly cuts out glare and haze. It removes unwanted reflections from non-metallic surfaces such as glass, water etc. and enables the colors to become more saturated, appearing clearer with better contrast especially in blue skies and white clouds. A FLD filter (fluorescent light correction) provides the perfect solution for obtaining pleasing skin tones and correct color while shooting without a flash under fluorescent lighting. This filter gives true-to-life color rendition by removing the harsh yellow-green cast ordinarily resulting from fluorescent bulbs. When shooting under natural light, a fluorescent filter dramatically increases color saturation of subjects such as sunrise and sunset. Works with any 58mm lens! Lifetime warranty! This entry was posted in Discount Photography and tagged 1855mm, 58MM, Canon, Cleaning, Cloth, F3.55.6, Filter, Gentle, HeroFiber®, lens, MultiCoated, Piece, Professional, Ultra, UVCPLFLD by Ball Photo. Bookmark the permalink.